When trying to come up with something green for Color Your Summer I decided on something that was green in more ways than one. I made my reusable produce bag out of an old knit T-shirt. And then I went crazy! and made more bags out of old T-shirts and T-shirt sleeves in various shapes, colors, and sizes. 1. 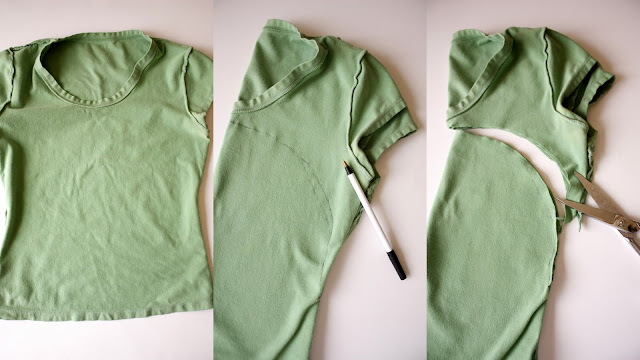 Turn your t-shirt inside out. Making the hem or bottom of your shirt the top of the bag, draw out the shape of your bag. Cut it out. You can keep the existing hem of the shirt or cut it off. Either way works fine. 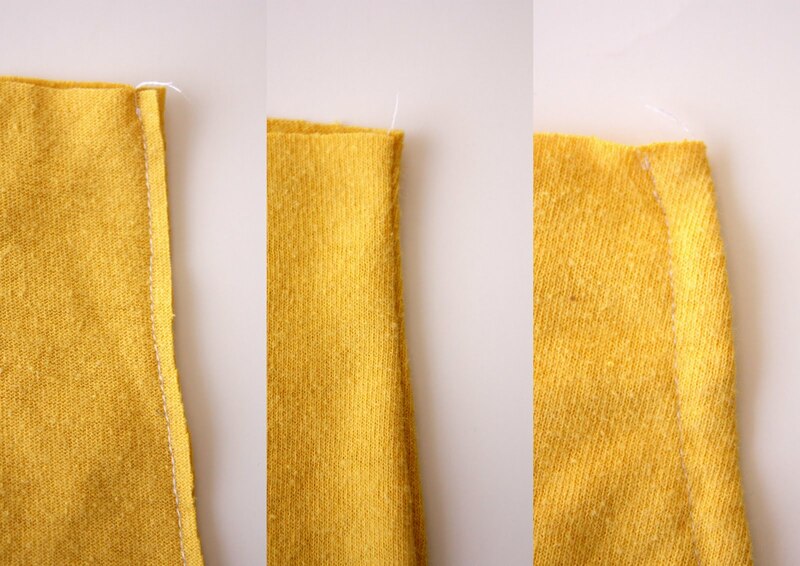 Using the existing hem may make the handles a little stronger though. 2. 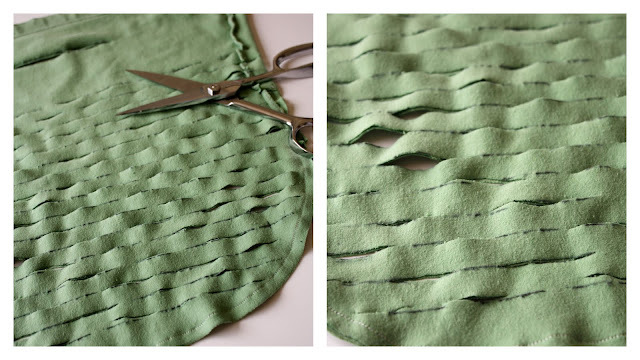 Sew with a straight stitch or a narrow zig zag around the sides and bottom of the bag. Leave it as is, knit doesn’t fray, or you can finish the edge. Or you can finish the raw edge with a zig zag stitch or overlock (serged stitch). An example of a zig zag stitch is on the left. 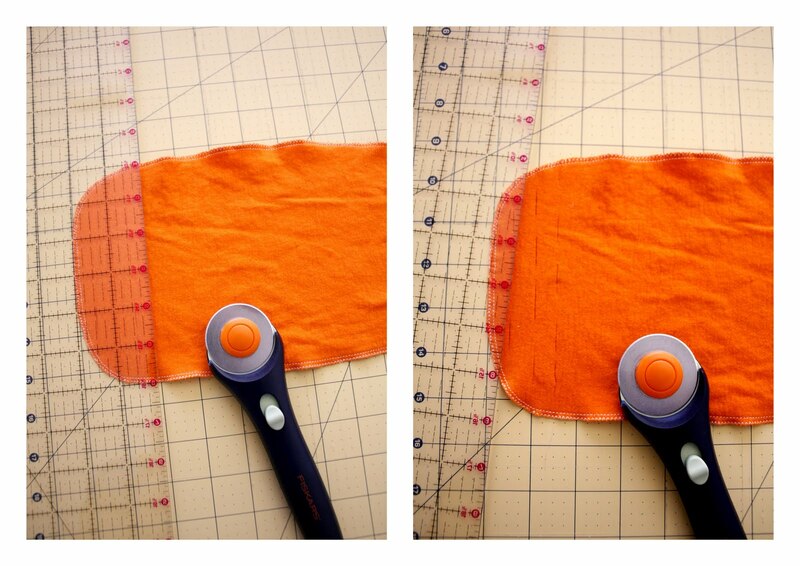 Option 1: Draw lines to help guide you and cut them out with the tips of your scissors. NOTE: On some bags, like this one in the picture above, I snipped over the seams. This is fine, but it will make the bag looser and more flexible. If you decide to do the same, be sure to make your cuts half as long as you really want them. This is because you are essentially cutting them on the fold. Option 2: Use your rotary cutter to cut your slits. Draw out your lines again or just eye-ball the staggered cuts and slice them quickly across. Make sure to use the ruler and gridded mat to help keep things even and neat. This method is hands down WAY faster and makes for less wear and tear on the tips of your scissors and your wrists. 4. Simply cut a slit for the handle through both layers of the bag. If you want to shape the top of the bag like I did in these pictures, do that now. 5. Then streeeeeeeeeeeetch the bag. That’s it! So easy right? Some knits don’t curl well, but I think it still looks pretty cool. or as my husband suggested, you can use them at the beach for your sandals! Genius. It lets alllll that sand slide out. You can easily pack them in with your reusable grocery bags so you remember to use them at the store. I don’t think they can entirely replace plastic produce sacks, but they are great for larger produce like apples, oranges, etc. Whatever you can do to reduce waste is a good thing though! Am I right? I made this one big enough to be a tote. It would be a cinch to put the smaller bags inside to keep things more organized. They are completely washable and can withstand hot washing temperatures, which I love. And you can make a whole rainbow of them to help color your summer! Delia, I've recently become a member of your blog but this is the first comment I leave. I don't remember how I found out about your blog… Nevertheless, I am here and enjoying myself. This particular project is inspired. It's a breath of fresh air. It's so lovely. And it's green. Thanks for sharing your beautiful work. What a thoughtful, sweet comment. Thank you! Oh my goodness!!! I love this project and will try it!!! I love it. Great gift ideas. I will be busy making it. Thank you very much. The bags look so pretty in all those happy colors! delia: these are adorable, and i can't wait to try them! love these bags! Thanks for the tutorial, they look so easy. I may have to make some today. You are so darn creative and cute! This is such a great idea! This is such a creative idea! Im going to try it! So cute. Can't wait to give this a try! These are great, Delia! And the pictures are beautiful. Who knew some bags would be so photogenic:). I nominated you for a blog award, go to my site and check it out! um…why are you so brilliant? it truly is the simple ideas that make the biggest impact! These are so pretty. Thanks for sharing! I love this bag! What a fantastic idea and it's so hip looking. I think it would work for all sorts of things! Thanks. This is a very clever idea! You're going to see these all over the place now. Nice work! 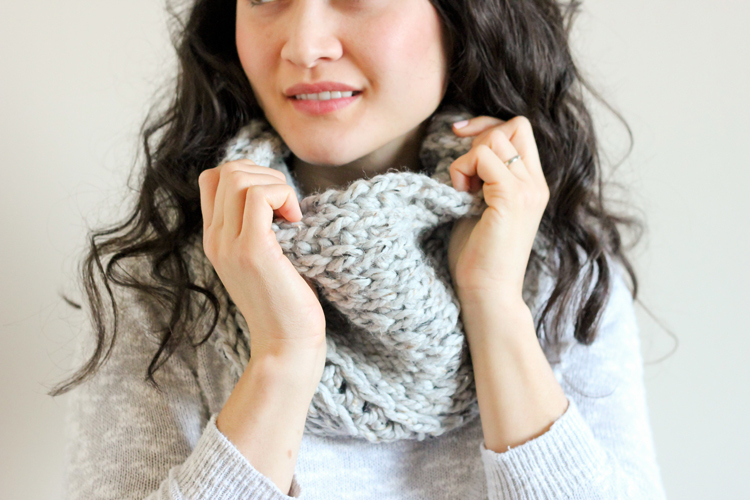 Goodness this is perfect to go with my ruffled bag project! I'm adding a bunch of these to my list. Love this idea. Thank you thank you! genius! 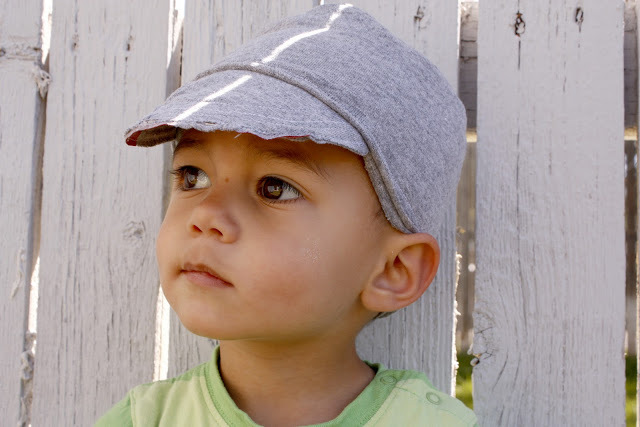 i can't wait to make some of these… they're absolutely adorable… and seem so easy to do! Love this! I had to go and make some too. I used my leftover sleeves to make little bags that would hold an orange or two or three for my single niece to use. Love this idea…I am making one now. I'm liking it! I actually think this technique would be quite interesting on a shirt. I LOVE this idea for so many reasons, but mostly for the EASE of it! I don't have many sewing skills. This looks like a fabulous project!! I'll be linking to this post from HealthyMomsKitchen.com! I really like this idea! And will make a few for my daughter out of some of her old clothes ;) She will love it. And of COURSE I'll make some for me too! On the handle, have you ever had a problem with it ripping, or over stretching when you put in your produce? Would it be a good idea to reinforce the handle some how? Very easy! And very cool! It's a great idea. Thanks for sharing. Now, to find old t-shirts!! This would be perfect for my first sewing project! Wow! 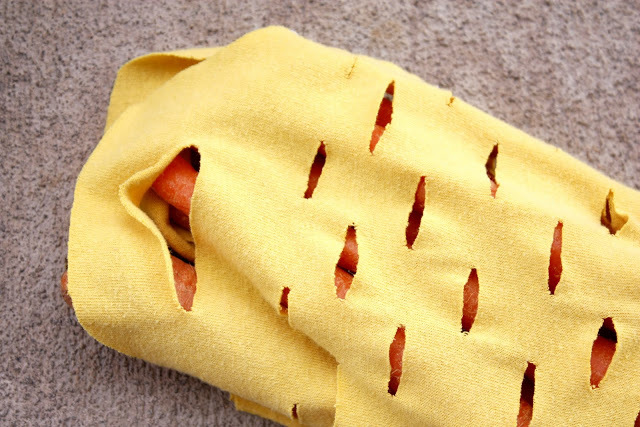 I don't even have a sewing machine but I'm going to rustle one up – pronto! I have a 7-year old son who is encouraging me to "Go Green" but sometimes it can be hard to do so economically; this fits the bill, perfectly! Absolutely love these bags! Thanks for the tutorial. My question is this: I figure these weigh about a quarter pound. When shopping at a large commercial store (ie. Kroger, Schucks, Hy-Vee) what do you tell the checker? Do they ask the weight of the bag? Do they assume it weighs as much as a plastic bag? I'm too money conscious to buy an extra quarter pound of produce. I was thinking the same thing. I cut the basics for one and cut a few holes. Then I weighed it on a postage scale. It was 4 oz. If apples are 2.49 a lb. , lets say, that would be 63 cents just for bagging them! I absolutely love the idea and was gung ho to make a bunch, then thought of this. Not sure what to do. Some stores will allow you to subtract the weight of the bag. I hope that helps? I loved this idea so much I linked it to my blog! I'm new at this blogging thing so please let me know if I didn't do it correctly. I would sooo be your first customer if you sold these on Etsy.com :) Great idea!! Fantastic. I love it. Thank you so much! I think this is a fabulous idea! I have seen other tshirt bags but I like ths one better and the photo of all the brightly coloured bags is great! I just found your bags through Pinterest and am your newest follower! Thank you for the great tutorial!!! This is so cool and they are so beautiful. Where are you other projects? I can't wait to see them! Came here from AOL.com's DIY Life. What a fantastic and creative idea! Love it…know what I'm doing this weekend! with a link back to you! What a great way to re-use.Congrats to you. If your inspiration came from somewhere else, I think is fair to mention the source. . . This is an awesome idea- so green and so easy! Thank you! This is a fabulous idea! Next time we need to reduce our t-shirt collection I will be making some very cool produce bags! Thanks so much for sharing. seriously?!?!?! I love this. i have been wanting something isimilar, but the ones in the stores are so expensive! Thank you for posting this! You are awesome. i love it so much, that i wrote a post on it! I posted a photo from this tutorial on my blog! I hope this is ok! I just made one of these. I was going to post about it, sending my followers to your blog through links. Is that ok with you? On My Blog ( easycutefundiy.blogger.com ) I Have A Direct Lick To This! Great Idea, Thanks! love this tutorial – one of the reasons why some of the fabric may curl more than another is if it is 100% cotton it will curl up nicely and if it has some polyester in it it wont curl up. since you made a mention of it…cheers. I found this on Pinterest…and I have to say, this is an amazing idea! I will definitely be doing this in the future! Idéia maravilhosa, vou fazer várias!!! Adorei a idéia e já fiz a minha, e a solução para a alça ficar firme não arrebentar e fica show e colocar intertela nas alças e fácil de usar, você coloca na parte de dentro e passa o ferro ela vem com uma cola e quando você passa o ferro ela gruda no tecido, também como não tenho máquina de costura fiz com linha de ponto cruz fiz uma costura trabalhada. 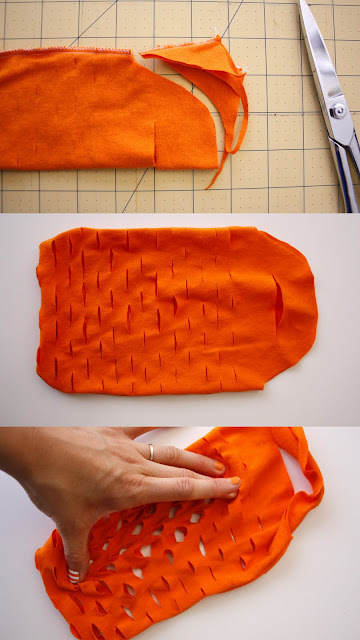 Minha bolsa ficou laranja com costura grossa para fora na cor branca;………..
Posted it on my Christmas DIY list! OH quick question…. how are your bags holding up? Have you had any issues of overloading them? I once met a guy with obsessive-compulsive disorder or a whole lot of time on his hands as he did this to ALL his T-shirts and then wore them. Sooo weird. He also packed a gun. He was totally scary. 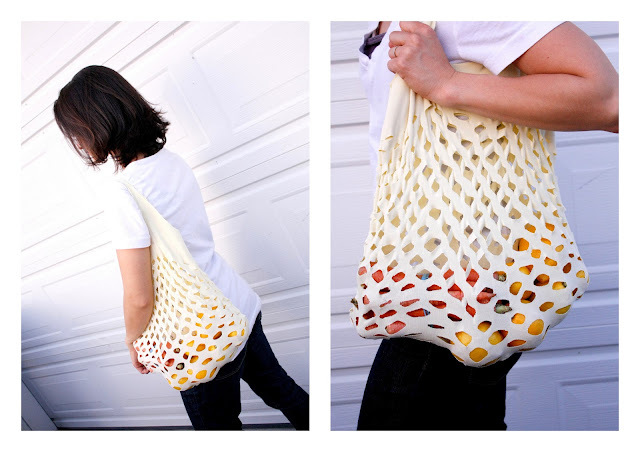 Nevertheless, this is a way cool idea for produce bags and I am going to make a couple. Thanks! Keep in mind though, if you're using these at the grocery store and buying things by the pound this can add anywhere from 1/4 – 1/3 of a pound, depending on the shirt…could get pricey. Great to collect everything at a farmer's market though. This is BRILLIANT!! I posted on Pinterest to share with my green friends. I hope that's OK. Its too fantastic not to share! Great idea! I made two of these bags today. Thanks! I love your bags! I was wondering if you have the dimensions for the tote-like one? Thanks! I love this idea!! Clearly you rock! Do you offer them for sale, to those of us who are not crafty enough to own a sewing machine? Love your tutorial. I would love to share this and pin it to my Pinterest board. Really love this tutorial, thank you! I shop at the farmers market here every week and I feel so bad with all of the plastic bags I bring home with me each time. This is a great idea. I really need to make a bunch of them to take to market each week. Great tutorial! What a fantastic idea! Thanks so much for sharing! These bags would be perfect for picking mushrooms in the woods. Plastic bags are not very good for morels, they can trap moisture and cause the mushrooms to get really soggy and ruined. These bags would be great because they would allow the contents to breathe. This is a great idea of recycling! This is the PERFECT solution for avoiding plastic bags at the local market. I’ll make a variety of these in all sizes and take them to the market each Saturday. Thanks for such a wonderful idea. I am in awe! I think the horizontal slits in your t-shirt bag make it much more functional as the slits open up with the weight of the items; that’s the whole idea, right? Anyway, thanks for the great tutorial! I need to break out my sewing machine now! I had a ton of t-shirts that simply don't fit or were victims of the "Great Failed Dyeing Event of 2010" that I refused to toss out. Made one today and it's great! I am going to make one for the beach for sandy clothes that can all just go in the wash, one for shoes at the beach, and one for curing potatoes and onions from the garden! GREAT idea, thanks so much! Such a great project. 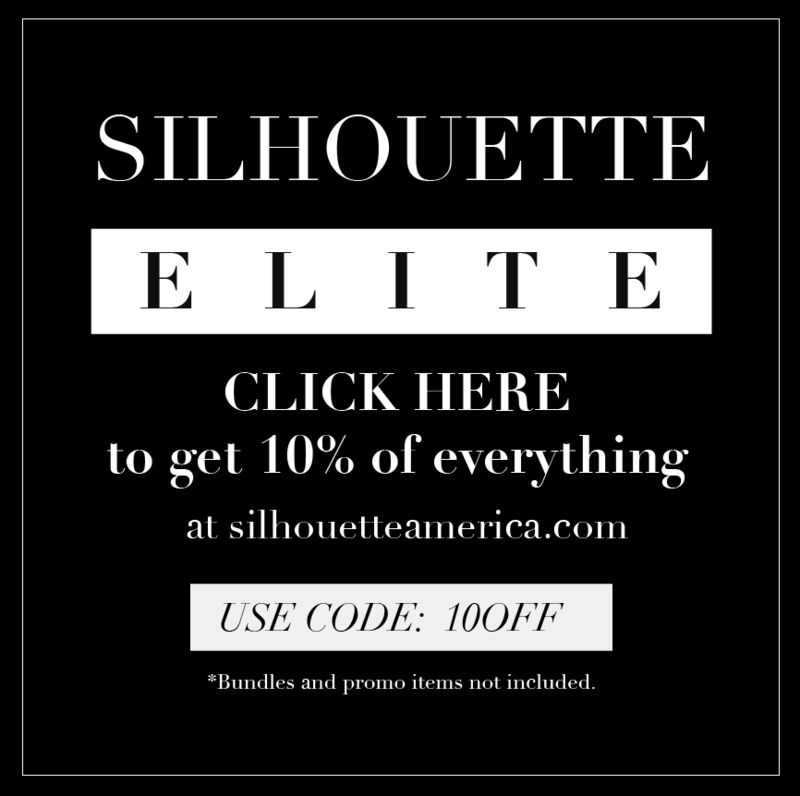 I found your blog by linking over from someone else's blog and am so glad I did!!! These are darling!! I love all the colours! Such fun!! You've more than demonstrated your creativity and I can't imagine anyone would look at your blog and all the things you've come up with and then think you'd lift someone else's idea. I tried this today!! I must say, for not being much of a sewer, my bag turned out great! (I hand sewed it). Ready to put it in the wash! A great tutorial I have shared on my Pinterest page, thank you, I love these bags! LOVE these! Posted to Pinterest, and I know that a lot of others will love these too. Thank you for sharing. Also, I just wanted to say, I love your nail polish in that picture. O Great pretty bags.Its very funny but very useful and creative idea to use t shirt and use it again different per pus. I'll defiantly use your idea. wow you look so stunning, I love this top ! What a great idea. I've made t-shirt bags before, but was never too pleased with them. I think cutting the slits in the bag makes all the difference. I have just begun a personal quest to be more "Green" and can't wait to create some of these produce bags for my own eco-shopping experiences…thanks for the tip! This is such a great idea! =) I've got lots of old t-shirts that will now be used for making bags. Thank you for this. Nice…I had a lightbulb…for small produce, stop cutting slits 1/2way between the handle and the bottom, or no slits at all…LOVE them, they are gorgeous!!! Congratulations Delia! Thank you so much for taking the time to share this exciting information. I found your blog on Pinterest… Really this is great idea and I like this… Thanks for sharing. So sweet! I'm going to link to this in a roundup at CraftingaGreenWorld.com next week! You could also lay the t shirt flat pin and sew the out line of the bag then cut it out after. It is a bit easier to work with. Awesome idea!! Somebody posted this on FB and I followed the link. What a great job you did! Thanks for sharing. Hey! This is just awesomely amazing! I like the IDEA of these but…..
Why cut the holes at all? Wouldn’t the produce be more likely to fall through? Wouldn’t they be breathable enough, just being fabric, rather than plastic? Also, how do you deal with the added weight issue? Do you dump the produce out at checkout, or what?!! Hamrsark – Thanks for your questions. I believe the original crocheted design which I created this sewn version after, uses it for mostly larger produce like apples, oranges, etc. You are certainly welcome to make ones without holes. The holes actually do help with breath-ability. I am open about how I don’t really use mine in the grocery store, just at the farmer’s market where they often sell it by how much it looks like you are grabbing rather than weight. (It does add a lot of weight, I agree.) I also don’t use my bags for things that it can’t hold well like green beans. I’ve tried with comical results. I hope that answers your questions. Please ask more if you are curious about more things. This idea is just GREAT!! Let me introduce your tutorial in my blog okusaman.com. My blog is in Japanese, and I write about craft & DIY things. I liniked back to this page. I think I’ll try to hand sew this, and just weight test it BEFORE I put produce in. My son left a large amount of Tees when he moved out 5 years ago. I have been wondering ( short of making a quilt out of them) what to do …. now i can make functional things to make and send a few to his room mate (aka girlfriend) and I can use them up. Wonderful idea. So simple. I will probably use the rotary cutter to cut them. So quick too!!!! Thank you Sandi! Don’t you love making upcycling stuff. It’s one of the best feelings. Happy sewing! Could you turn the shirt inside out, sew the bottom shut, then cut the sleeves and some of the collar off to use as handles? Then you could have a bigger bag and waste less of the shirt.. I am definitely planning on doing this with my old t-shirts! I was wanting to have something for the farmers market and these are perfect! They provide plastic grocery bags, but I am trying to move towards a greener lifestyle. Thanks for your post! Thumbs Up! I love this beach bag you have created with an old T-shirt. I hope I can successfully make this beach bag soon. i love how your brain works! i was chuckling as pics rolled by! love the idea & don’t sew any more but i can hand stitch & may even try stitch witchery as fusible method. Thank you!! I have found my childhood sewing machine in the loft space and I have been looking for something to do with my 7 year old, using it. I think this will be the perfect first project and Grandma will love them when they arrive as a gift. Thank you. I just happened on your site and am glad I did. I was wondering what to do with all my tees that have mysterious spots. I can’t wait to get started making them. Keep up the good work. Thank you so much.Theses are great.Just found you on Pintrest.will be back for sure.Thanks so much. I am a university student doing a project on “upcycling” and I would like to have your permission to use one of the above images in a slideshow. Love these bags! I have been looking for a good use for the piles and piles of old shirts I don’t have the heart to throw away. I think I’ll try to “double bag” them with the inner bag non-holey for a fun color-contrast thing and so I don’t loose the smaller things I carry around at the farmers market! Love it! For everyone concerned about the weight of the bag at the grocery store, you can weigh the bag itself beforehand and give the cashier the Tare weight (the Tare is the weight of the container taken off the total price). I’m just (finally) making a few of these wonderful bags, and realized they could also be finished with a drawstring top by leaving the original hemline at the top of the bag, snipping it on either side of one of the bag’s side hems, and adding a string. Thanks for sharing this clever idea with the rest of us, Delia! That’s a great idea Kim! This is a great idea. I think these would be so much better than the cloth grocery bags because they look like they would wash so well. The beach bag idea is genius! How does the cashier weigh your produce without charging for the bag? Good question! You can have them weigh it outside the bag and re bag it if you desire. I have mostly used my bags at the farmer’s market where things are not weighed. I hope that helps. Do these bags keep your veggies as well as plastic? What about lettuce? What kind of a reusable bag can you put it in to keep it fresh and crisp? Great question! It depends on the produce. It can absorb the moisture from most veggies, so it isn’t ideal to use for long term storage. For lettuce, I usually remove it from the bag and just store it in my crisper. I wash it before each use, so it works for me. If I wash it ahead of time and store it for later, I chop it up as well and put it in a glass bowl with a lid. I hope that helps! Delia, muy buen uso de prendas que ya no se usan . Thank you for the wonderful idea! It is hot outside today so I will stay inside and make a couple of these recycled, reusable, washable, cute, bags!!! Lots of t-shirts to be used! Thanks Bonnie! Sounds like a good way to pass time. :) Happy sewing! I made mine out of tank tops. I just sewed up the bottom and used the straps for handles. Easy-peasy! Lovely idea! I have tons of old t-shirts left in the basement and prepared for disposal, and this is a good reason to do some recycling. My girl would be glad to help too, we often talk about recycling, now. Thank you for the inspiration! Delia, I saw your produce bags from tee-shirts & absolutely love them. I’ve been doing crafts for years & have always tried to make something out of something used & this is awesome! So simple & a great tutorial! One question, what size tee-shirts are you using for the produce bags & the tote? Love your Pin & will be looking forward to more awesome ideas! Thanks for the tip! I am going to give this one a go. So glad to have stumbled across your website. Jam packed full of DIY goodness, how have I not come across you before??? Very cool it looks, the same I have also done so. At the moment I tried the simplest but much less nice http://www.open-youweb.com/how-to-make-at-shirt-bag/ see how this will come out again. Very smart! Thanks for the tip!